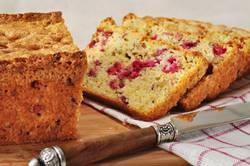 Here is a delicious Cranberry Bread for you to try. This Cranberry Orange Bread pairs the tartness of fresh cranberries with the sweet citrus flavor of freshly squeezed orange juice. Besides its wonderful flavor, this Cranberry Orange Bread is lower in fat than most, as it uses only 4 tablespoons (57 grams) of butter and replaces the more commonly used milk with orange juice. I adapted this recipe from Jean Anderson's 'The American Century Cookbook' where she tells us that this recipe was developed by Ocean Spray around the middle of the 20th century. For a little trivia; Ocean Spray began in 1930 and was formed by three cranberry growers who wanted to expand the market for their product (cranberries). Together, this cooperative did just that; first with the introduction in 1930 of Ocean Spray Cranberry Juice Cocktail, and again in 1963 with the introduction of the first fruit juice blend, Cranberry-Apple Juice Drink. They have had many successes since, one being sweetened dried cranberries that were introduced in the early 1990s. Cranberry Orange Bread: Preheat oven to 350 degrees F (180 degrees C) and place rack in the center of the oven. Grease (or spray with a nonstick vegetable spray) a 9 x 5 x 3 inch (23 x 13 x 8 cm) loaf pan. Toast the pecans or walnuts for about 8 - 10 minutes or until lightly browned and fragrant. Let cool and then chop coarsely. In a large bowl, whisk the flour with the sugar, baking powder, baking soda, salt, and orange zest. Cut the butter into small pieces and blend it into the flour mixture with a pastry blender or two knives. The mixture should look like coarse crumbs. Fold the wet ingredients into the dry ingredients. Stir in the chopped cranberries and nuts. Pour into the prepared pan and bake for 50 - 60 minutes or until a toothpick inserted into the center of the cake comes out clean. Remove from oven and let cool on a wire rack for about 10 minutes. Then remove the bread from the pan and let cool completely before slicing. This bread can be frozen. Anderson, Jean. The American Century Cookbook. Clarkson/Potter Publishers. New York: 1997. Daly, Regan. In the Sweet Kitchen. Random House Canada: 2000.